Custom House station in London’s Docklands forms part of the innovative Crossrail development. When the new station opens in December 2018 a train will run every five minutes at peak time in each direction terminating at Paddington in the west and Abbey Wood in the east. The plan for the station is to offer a simple, straightforward journey from the station entrance to the train doors. Access to the Elizabeth line platforms is via lifts, stairs and escalators from a spacious upper concourse. One important aspect is the construction of a new lift shaft for disabled and mother and child access to the runway over Victoria Dock Road. The main contractor on the project Laing O’Rourke contacted PRS to eliminate the potential risk of rainwater from four drainage pipes leaking from the station roof down into the adjacent lift shaft. An immediate solution was required by Laing O’Rourke in order to meet its tight delivery schedule for the project. 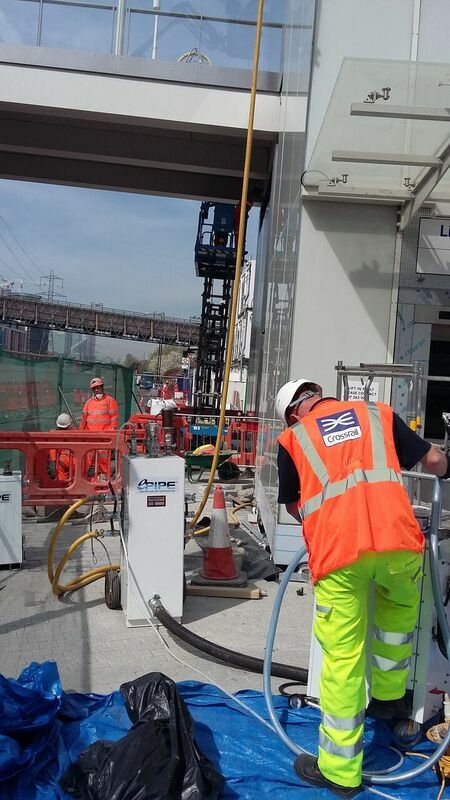 A team from PRS worked seamlessly among the many contractors already on site to meet the very high safety standards of both Laing O’Rourke and Crossrail, which were in line with PRS’s own stringent industry standards. With the handover of Phase 1 due to be completed by 10th May, PRS prioritised the job to enable Laing O’Rourke to meet the deadline. PRS used Mobile Elevating Work Platforms (MEWPs) to access the lift roof and completed the ePIPE application over 2 days due to the logistics required onsite. On completion, Laing O’Rourke witnessed a successful pressure test on all four lines.